Together with two other wind farms, the Westermeerwind Wind Farm forms Noordoostpolder Wind Farm. This wind farm is the largest wind farm in the Netherlands, and can generate circa 1.4 billion kWh of clean, sustainable energy each year with 86 turbines. Enough to supply over 400,000 households with power annually. That makes the Noordoostpolder Wind Farm a European front-runner. 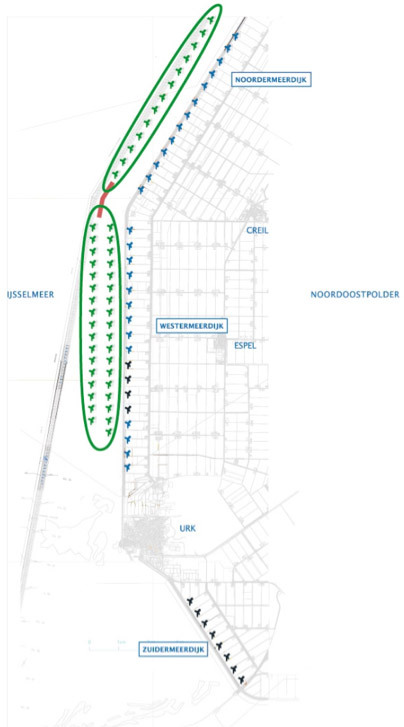 The municipality of Noordoostpolder has chosen to concentrate wind turbines in one area, to minimise their impact on the landscape. The Noordoostpolder is one of the best locations in the Netherlands, because of the ideal wind conditions and the long landscape lines, allowing for a wind farm to be well-integrated into the landscape.